And for players who think pledging loyalty to a faction based purely on loot, and not on tradition, lore, or role-playing is missing the point, prepare to learn why your Guardian may be a Dead Orbit soldier already. "The Traveler is not our only salvation. Another future lies out among the light of other stars." As you might guess from the name, the Dead Orbit faction stands as the philosophical opposite to the New Monarchy (hence their overall 'Goth' aesthetic). Jokes aside, the Dead Orbit and their leader, Arach Jalaal could be the start of a science fiction epic all their own. Unlike the optimists of the Last City, this faction believes that Earth's time has come and gone. True survival for the human race, they argue, can only be found beyond our planet and star in the unknown reaches of deep space. So instead of putting down roots and investing in the future of the Last City or the Guardians who call it home, they make it clear that their plan is to load up all the supplies and citizens they can... and leave Earth for an unknown future. There's a sense of uncertainty and courage required in the face of such overwhelming odds, and fatalism is a worthwhile view to take when discussing the merits of joining their ranks. The Dead Orbit members know that taking such a leap into darkness will see many people die along the way in service of humanity's survival. And by 'survival' we mean 'finding any way to survive whatsoever, no matter where or what the cost.' But then, that's kind of their style (and typically seen as having the best armor and weapons for the Hunter Class of Guardians). So you can't knock them for being somewhat optimistic, in their own way. For a deeper dive into the history and lore of Dead Orbit, check out the video below (and skip past for the benefits coming in the Faction Rally). To make sure the Dead Orbit doesn't come off sounding like the villains of thi story, it should be pointed out that they're not necessarily wrong about Earth's prospects. A major part of their belief is that after so long hovering in the sky without any assistance or signs of life, the Traveler is better left behind. It offered its help, but The Darkness that opposes it is bound to follow it to Earth eventually. Since the final, post-credits scene of Destiny 2's campaign suggests this might actually be correct, expect the Dead Orbit faction to continue to play a main role in the series going forward. If not for their accurate predictions, then for the fleets they've been building to usher humanity off of their dying world. It would be nice to think that the recent activity concerning the Traveler - showing it is still very much alive - might change their outlooks. But the truth is the arrival of the Red Legion proved their theory of the Traveler remaining a target that puts all of Earth in jeopardy. But as realists, the truth is clear: most players will likely join up the Dead Orbit for their slick black shaders and the weapon offered if they win the Faction Rally. We expect plenty of players will be pledging their service to Dead Orbit even if they don't share their bleak/adventurous spirit. 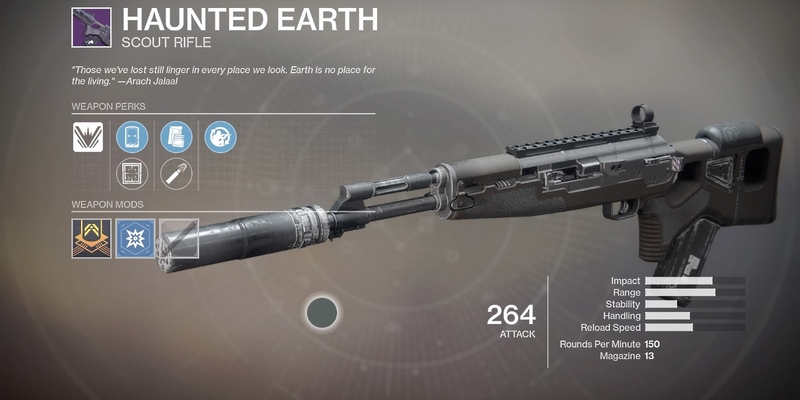 That's thanks to the gun offered as a Faction Rally reward: the Haunted Earth (Scout Rifle). The name is what we would expect of the faction, but the rifle's unique benefits also reflect the shrewd, patient, cunning, and ruthless style of Hunter-esque Guardians. The all-black rifle (typical of the black/white/silver shaders of Dead Orbit) fires at a slower rate with massive damage, is most accurate when the shooter is motionless, and reloads faster when players are crouched. Sound like your play style? Then it's time to leave this planet behind (at least in outlook). There's no wrong answers to this decision.